Head Coach Brian’s coaching philosophy is that you must be having fun – even when learning and working hard! 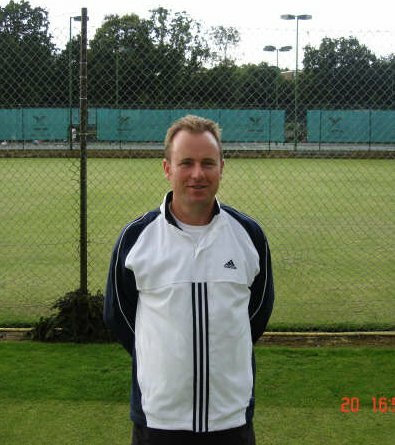 He has extensive experience of working with both junior and adult players and has designed several new programmes for EDLTCC, ensuring that there is something for everyone to enjoy or to work toward. So, whether you are a beginner or want to take it to the Max feel free to give him a call to talk about individual tennis lessons or any of our group programmes. There is also a new virtual pro-shop at the club, so if you are looking for any tennis equipment, log on to www.mdgsports.co.uk as Brian can offer discounts on the online prices quoted. Coach to Louis Allen (aged 8-16 years) Dorset Mens singles champion 2016. National 16 and under doubles champion 2016. Coach to Lana Rush (aged 8 to 13 years) Cheshire county champion u10. National 10 and under champion 2007. Individual coach to Scott Dickson (aged 9-17 years) GB No 1 at all Age Groups. Represented GB in Summer and Winter Cup at Numerous Age Groups. Winner under 14 indoor nationals. Points Leader Under 18 Winter indoor Nationals. Winner Under 18 National Doubles. Winner ITF Nottingham. Runner-up ITF Wrexham. Played Wimbledon ITF Juniors 2005 and 2006. Winner Under 16 Indoor Nationals. National indoor under 18 champion. She played The Championships at Wimbledon twice against Camilla Giorgio and Maria Sharapova. Winner of many WTA singles and doubles events, including ITF Doha Qatar and Nottingham. Highest WTA ranking 168. Coach to Kim Schmeider (aged 9 to 14 years) Cheshire county champion u10 and u12. National clay court 10 and under champion 2005. Emma, who was born in Bournemouth, started playing tennis at 6 years old. From a very young age Emma knew that she wanted to be a tennis coach so later chose to study a degree in Sports Development and Coaching at Bournemouth University to help with her desired career. During her time at university, she regularly competed for the BU tennis team. Emma has been working in tennis coaching for 10 years so has a lot of experience of teaching anyone from beginners right through to advanced players. Before coming to East Dorset, Emma was running the successful coaching groups at Swanmore Gardens, which provided affordable tennis for all. She firmly believes that everyone should be able to play tennis regardless of age, ability or background. The most important thing is that people enjoy themselves when they are on the tennis court so she always makes sure that lessons are fun while focusing on a learning objective. Tom has been a full-time tennis coach for over 10 years now and Level 4 qualified since September 2015. Tom’s aim is to make his time on court for players enjoyable whilst making sure that they get the most out of the sessions regardless of ability. He’s a very passionate tennis coach who is fully committed to his players and club. Having grown up playing tennis at East Dorset, Tom’s excited to be able to get to back to where he started and bring some of his knowledge and skills to what he knows is a great club.